Unveiled at Watches&Wonders 2013, the Panerai Radiomir 1940 Chrono Monopulsante 8 Days GMT is the first chronograph of the 1940 range, and also features one of the most elaborately decorated movements found on a Panerai. 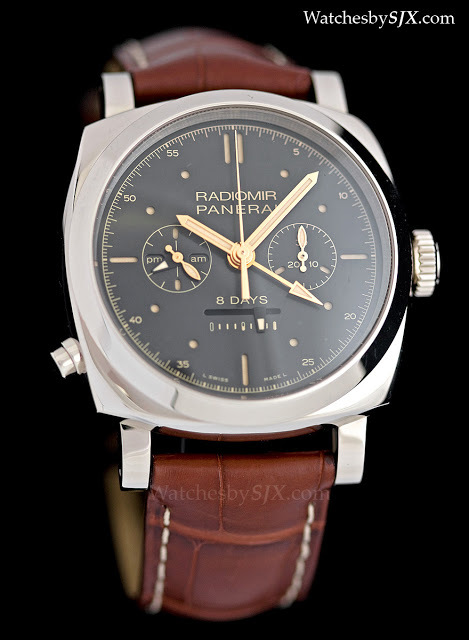 A cross between the Luminor and Radiomir case styles, the Radiomir 1940 key focus of Panerai’s 2013 line-up. Panerai has now added a chronograph to the line, the Radiomir 1940 Chrono Monopulsante 8 Days GMT, available in Oro Rosso (red gold with the reference PAM00502) and Oro Bianco (white gold, PAM00503), equipped with the P.2004/10 movement. 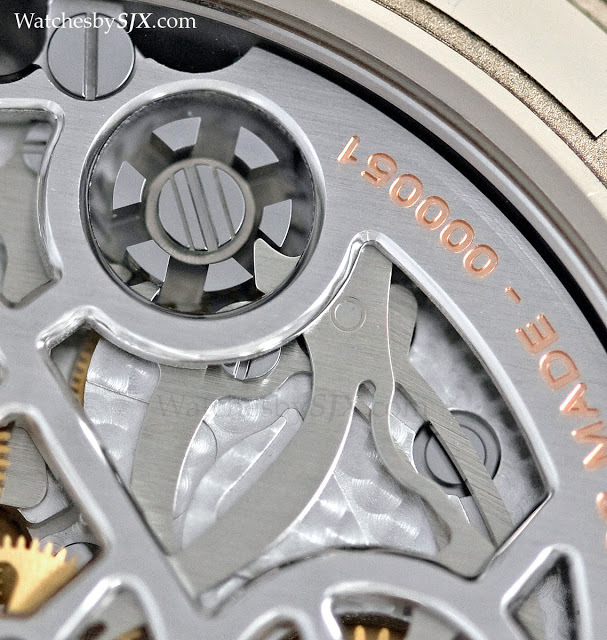 Though not a new calibre, the P.2004/10 is a more elaborate version of the original P.2004. The improvements are aesthetic, with the three-quarter plate and barrel having been skeletonised. 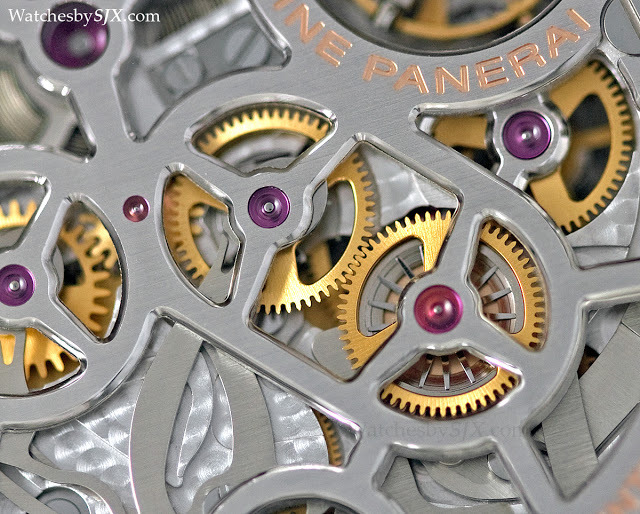 The result is an attractive looking movement, probably the most visually compelling Panerai movement. That’s due not just to the open-worked parts, but also because visible effort has been taken in decorating the skeletonised three-quarter plate. All the edges of the plate sport anglage which is clearly manually applied, resulting in a rounded and polished bevel. This contrasts with the typical Panerai edge finishing of a harsh bevel cut by machine. 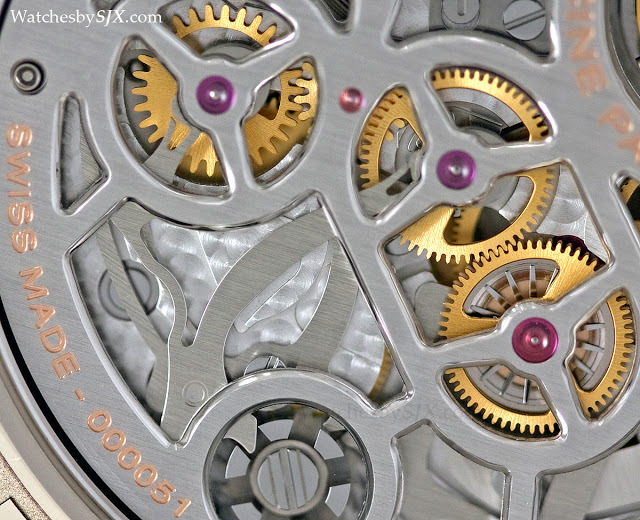 Oddly enough, the balance bridge of the movement is finished with that very method, and the bevelling stands in stark contrast to the three-quarter plate. 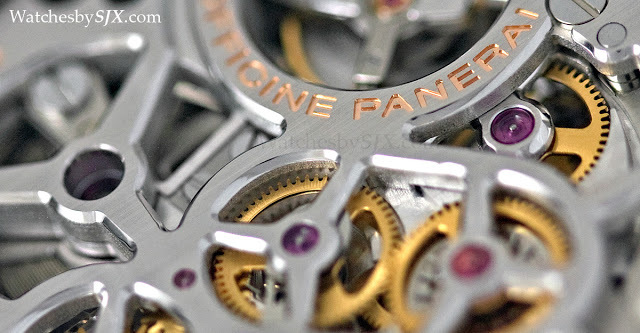 Anglage aside, the rest of the movement features decoration that is standard Panerai. More could have been done, especially on the exposed chronograph levers. 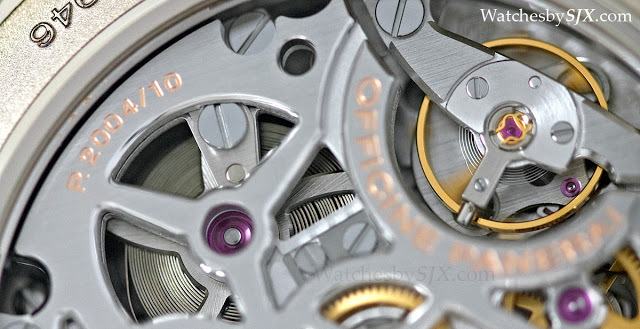 As they are now, the steel parts of the chronograph mechanism are just brushed, with the barest of bevelling. Mechanically the P.2004/10 is identical to the earlier versions. 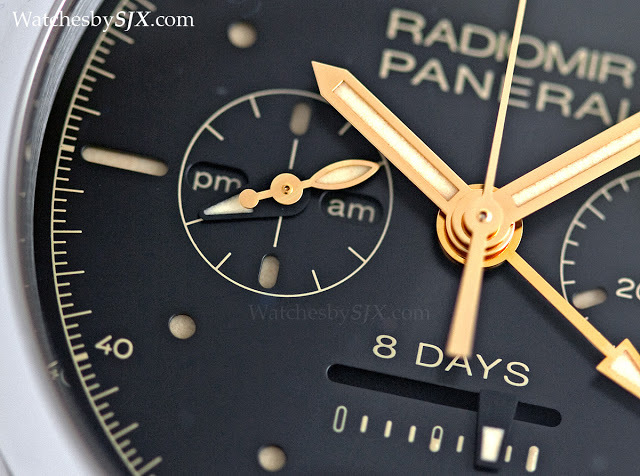 It has a single-button chronograph with the pusher at eight, a second time zone hand with day and night indicator at three, as well as Panerai’s trademark linear power reserve at six. 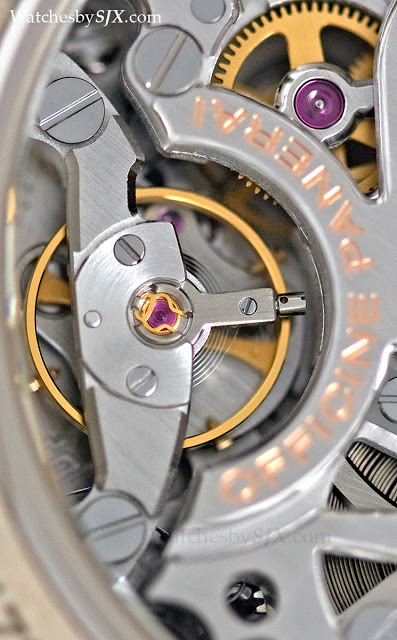 Thanks to three barrels, the movement has an eight day power reserve. 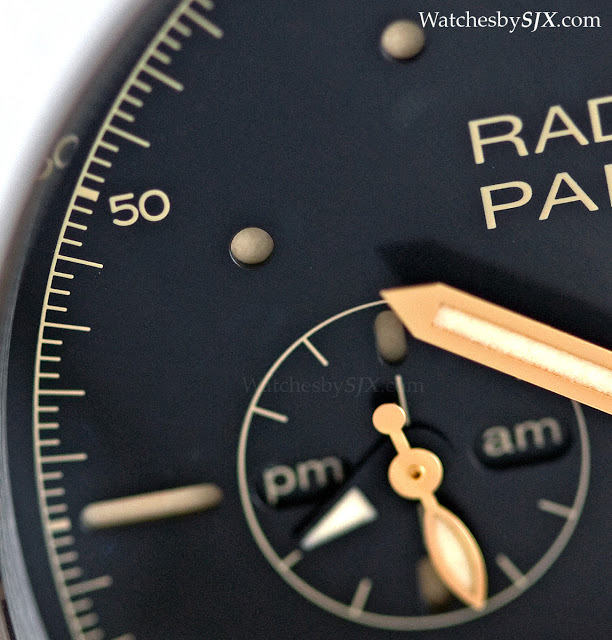 The Radiomir 1940 case is 45 mm, making it large and hefty. Though the case is generally simple in execution, one detail that stands out is the relief text around the case back, a first for Panerai. 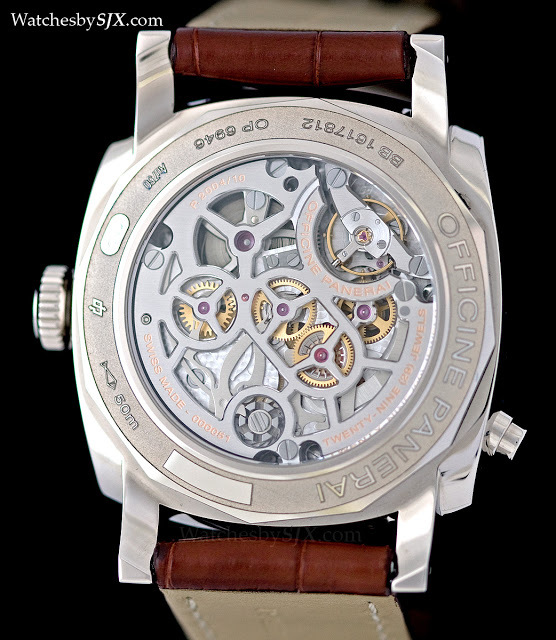 The dial, black on the white gold and brown on the rose, has a metallic, sunburst finish. 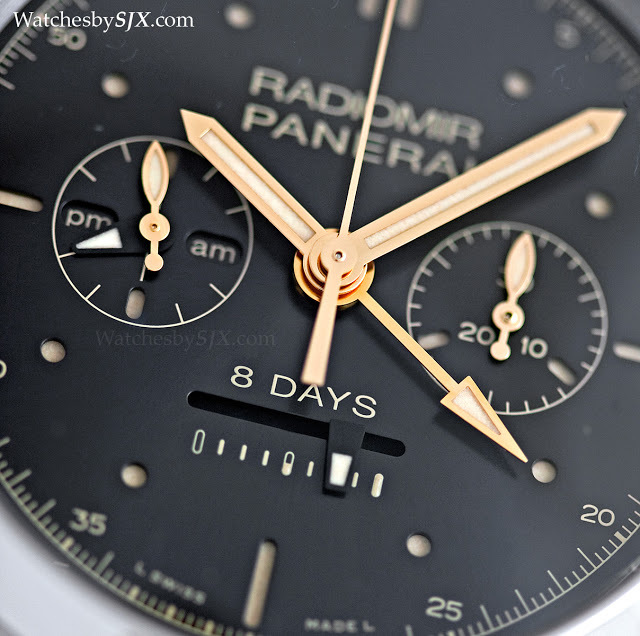 Like most other Panerai watches, the dial has a sandwich construction. That means all the indices are actually cut-outs showing the luminous material underneath. Panerai's most successful speciality has always been historical remakes made in small numbers, just like the new Radiomir 1940 Marina Militare 3 Days Acciaio PAM587.